Description: New Acer laptop hinge set. 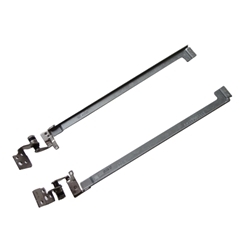 There are two different sets of hinges for the models listed. This is the slim version and the least common of the two. Please check the picture and part #'s to make sure that these are the ones that you need. Part #'s: 33.R4F02.005, AM0C9000800, AM0C9000900, SZS-L, SZS-R.
Acer Aspire 5742, 5742G, 5742Z, 5742ZG.